“We beat ourselves more, so we have to focus on us,” senior running back Tre Watson lamented. Horns senior linebacker Breckyn Hager had to shake his head, and agreed with the sentiments. While Week 1 didn’t “feel like last year,” according to head coach Tom Herman, like last year, it still feels like the Horns have their arm in someone else's hands as they say "stop hitting yourself." How hard the Horns are on themselves after the tough loss last week, versus how they grow from adversity and learn to stop beating themselves in-game, will go a long way to how long they play this year. Last year, Texas took the loss to Maryland and never truly recovered in finishing just above .500 for the season with the slow start this season feeling all too familiar. This season, Omenihu admitted he was surprised the team took off to a slow start, but says he knows that won’t — and can’t— continue. The gamut of games coming against fierce foes means the Horns have to bounce back in a way that they continue to grow if they want back in the Top 25. And beyond. Take Offense. By the Horns. Texas took too long to get the gears going smoothly. That won’t be the case against Tulsa come Saturday’s home opener at DKR Texas-Memorial Stadium. 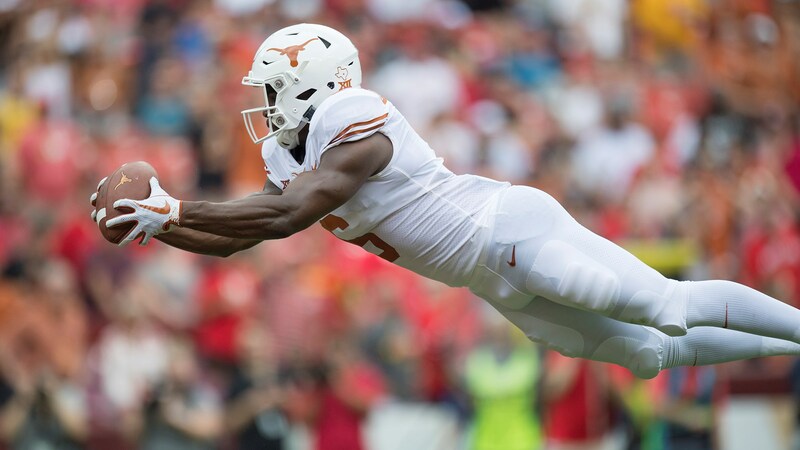 The sensational catch from wide receiver Devin Duvernay didn’t just impress fans and teammates, it let the Horns hone in on letting loose early in Week 2. Meaning more magic to the talented wide receiver core. “It was epic. It was fun. It was a big time catch and it's what you work for all off-season,” Duvernay said of his catch. The senior Longhorn said the start and the finish have to match to accomplish more of that. “We just have to finish the game. We have to execute better and be more sound on offense,” he said. Texas could show us — and the world — some new wrinkles Saturday, or the things they’ve been on the cusp of bringing to fruition could come to the forefront. A fast start, a firm finish, and the Horns just may … well, hook even the nonbelievers back in. Should Texas tighten up those little things they’re talking about, this team easily goes from formidable to consistent. Five of Texas seven losses in the Herman Era have come by seven or fewer points. It’s up to Texas to decide if that’s a harbinger of good things to come, or a foreshadowing of being unable to escape their own shadow again. The Texas team reiterated that the loss to Maryland wouldn't linger. It didn't appear to a year ago, when the Horns crushed San Jose State 56-0 but lost at USC by just three the following week. With three consecutive home games starting this week, a clean sweep would put Horns in good shape heading to the back half of their schedule. After Tulsa, No. 17 USC comes visiting followed by No. 16 TCU. After those two tough tests, a 3-1 record after four weeks of play would be some sweet homecooking. It’s an old adage — is it the heat or the humidity? Against Maryland in the opener, it was both for the Texas football team. Needing to keep its cool, the Longhorns couldn’t ground down against the early offense and onslaught from the Terrapins and fell far behind in the early going. Then it cooled down considerably, eventually leading to a rain delay as Texas was making hay toward a bid for the win. But it was too late for a cool comeback and a hot start to the season with a win. The heightened humidity in Maryland at the start of the game, along with the rain delay which inadvertently let the Terrapins D rest at a crucial time of the comeback, factored into the game whether the Horns wanted weather to be a factor or not. Saturday is set to have a high of 86 degrees and possible thunderstorms, which could elevate the humidity here at home, and/or it could cool things off and even lead to a surprising weather delay a second straight week. Hopefully, come Hell, high water, or another halftime deficit, the Horns are prepared to prove this season still has blue skies ahead.